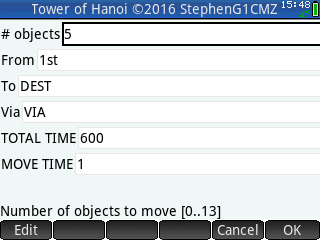 Description: Tower of Hanoi game that allows you to enter a challenge time, and calculates the average time per move or enter an average move time and calculate how long a practical activity with real objects will need. It implements the minimum 3-towers solution to the problem. It lists the required moves in lists L1 (from) and L2 (to). There is no animation of the contents of each tower.